Burnley’s former MP Gordon Birtwistle has criticised Burnley Borough Council for spending nearly £2m. on its ongoing Local Plan – describing it as “a glossy brochure” and revealing that it is running later than expected. Coun. 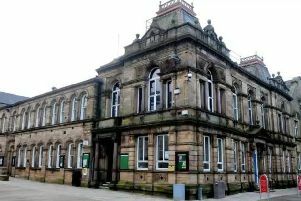 Birtwistle, the current leader of the Burnley Liberal Democrat group, asked the council to reveal how much it had so far spent on preparing the document which sets out how and where housing and new industrial units will be built in the borough in the coming years. Without it (Local Plan) decisions on where new homes or businesses are built will be taken out of our hands. He said: “I have been told that, to date, the council has spent £1.54m. on producing the Local Plan. By the time it’s finished, the total cost is expected to be £1.9m. “All of this money is coming out of revenue accounts. I think it’s a staggering amount of money, just to produce a glossy brochure. It is also running late. “I appreciate we have to have a plan but I think that money could have been better spent elsewhere. I think we could have done this for around £200,000 to £300,000. The Government has recently confirmed that local authorities which do not have a Local Plan in place by April 2018 will not receive New Homes Bonus – a scenario which the council said would add further pressures to the budget challenges it faces and impact on its ability to delivering existing services to residents. Burnley Council officers are continuing to make progress on work to develop the new Local Plan which will help shape the borough over the next two decades. The Plan is a long and complex process to create one of the most important documents the council produces, securing investment in new homes and jobs in the borough. As a result a decision has been made to re-schedule the dates on which the executive and full council were due to discuss the Local Plan. The new dates are to be confirmed. Coun. Sue Graham, the council’s Executive member for regeneration and economic development, said: “The Local Plan process began in 2010 under the previous administration. Every quarter for the six years since then councillors have been given a detailed report on progress. “Drawing up a new Local Plan is a statutory process; it’s something we have to do by law. It’s also one of the most important documents and pieces of work the council is responsible for. The Local Plan is about ensuring we can continue to attract investment into our borough and ensuring we have the housing and jobs we need, as well as protecting the wider environment. “The Local Plan, once agreed, will be the blueprint for the development of the borough which will shape our communities for the next 16 years. “Without it decisions on where new homes or businesses are built will be taken out of our hands and we will have a lot less control over how the borough takes shape for the next generation. “It is a costly and lengthy process but it’s one that we have to do, taking into full account the views of all interested parties, and one that we have to get absolutely right. That’s exactly what we are doing.